http://www.JewishWorldReview.com | To listen to some people, the messiah has arrived at the United Nations. What was formerly a veritable cesspool of anti-Semitism is now, we are told, rapidly becoming a forum where Israel can get a fair shake. The headline in a story on the issue in The New York Times last week read "U.N. Is Gradually Becoming More Hospitable to Israel." Other similar pieces in recent months all struck the same tone: Israeli diplomats are no longer getting the cold shoulder in every U.N. forum. In some instances, they are even being treated like human beings. Indeed, Israel even applied for a two-year seat on the Security Council, and its ambassador may take a turn as that powerful body's president for a month in the distant future. Dan Gillerman, Israel's very able ambassador to the United Nations, was even chosen as vice president of the General Assembly this year and, for the first time, an Israeli presided over the same body that once equated Zionism with racism. The Jewish state's diplomats are also still crowing about the fact that Prime Minister Ariel Sharon actually addressed the U.N. General Assembly last month without generating demonstrations by other delegates. For the moment, these are all signs that the world body is treating Israel like any other nation. And the country's embattled envoys  who have longed for acceptance there like a wallflower yearns for someone to ask them to dance  couldn't be more pleased. The United Nations seemed to be sliding back toward old-style anti-Semitism as the organization reached its zenith at its International Conference on Racism in Durban, South Africa, in the weeks before the Sept. 11 attacks. 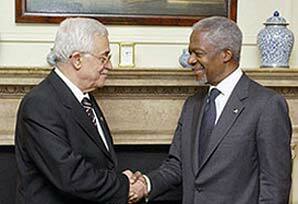 But Secretary General Kofi Annan has been spreading good will toward the Jews right and left these days. In the last year, the United Nations officially condemned anti-Semitism (amazing!) and commemorated the liberation of the Nazi death camps. But before we prepare to sing the praises of Annan and the rest of the inmates of that peculiar birdcage that sits on the shores of Manhattan's East River, a little perspective is needed. Along with appreciation for the gestures, we need to ask why this is happening, and just how far this new passion for fairness extends. The answer to the first question is more than obvious. Annan and the United Nations are in deep trouble. The fallout from the oil-for-food scandal has just begun. Billions intended to aid the Iraqi poor during the last years of Saddam Hussein's regime instead fell into the hands of Saddam and his foreign partners in crime while Annan did nothing. Even worse, his son Kojo played a role in this grand larceny. And that's just the tip of the iceberg for an institution in which corruption, inefficiency and hypocrisy are merely business as usual. The call for reform was so widespread that, in a comic turn, Annan took it up himself this year. His strategy for halting the momentum of the United Nation's critics was smart: Throw the Jews a few bones and hope that the barking of the activists will settle down. But beyond the atmospherics that are so dearly appreciated by those lonely Israeli diplomats, what is really changing at the United Nations? The answer to that question is far from settled. That's because no matter how many tea parties Israeli envoys are invited to, U.N. anti-Zionism is grounded in more than just the hard hearts of so many of the delegates and permanent employees there. It's at the United Nations and its agency offices around the globe where hatred of Israel is not merely an opinion. There, it is institutionalized in committees and agencies that exist to undermine the legitimacy of the Jewish state and to provide forums for those who wish to attack it. Chief among these institutions is the U.N. Relief and Works Agency, created in 1949 ostensibly to aid Palestinian refugees. All other refugees around the world since then have depended on the U.N. High Commission for Refugees for help. Only the Palestinians have their own U.N. agency. But unlike every other refugee problem, the Palestinians were not resettled but rather kept in place (through the good offices of their own U.N. agency) so as to better facilitate the ongoing war to destroy Israel. Over the years, UNRWA morphed from being a group merely dedicated to aiding the siege of Israel to one whose employees in places like Gaza were themselves affiliated with terrorist groups, such as Hamas. But the problem doesn't begin and end there. The U.N. committee on the "Exercise of the Inalienable Rights of the Palestinian People" and its division of Palestinian Affairs and "Special Information Program" on the "Question of Palestine" have been there to fuel hate at every possible U.N. forum. These organs of anti-Israel propaganda have served to fuel the conflict. And the corruption and waste at these agencies make the oil-for-food skullduggery of the past decade seem like just more of the same. But in the coming months, Annan will have the opportunity to do more than stroke the hurt feelings of Jews. If he is serious about reform, along with everything else on the table, he can actually start to move to cancel the mandates of the machinery of hate. As Amy Goldstein, the director of U.N. affairs at B'nai B'rith International, told the Jewish Telegraphic Agency, if Annan can actually reform the rest of the world body but leaves out the Middle East, that "would just demonstrate that the U.N. is singling out Israel and the Middle East for treatment which basically is anti-Semitic." So far from taking our cue from happy Israelis (who to their credit are far from sold on Annan's tactics), American activists need to be even more intent on holding the secretary general's feet to the fire in the coming months. He may think he can buy goodwill with atmosphere, but we're more interested in what he's actually serving up. The signals we should send to Congress and the White House are those of increased monetary pressure on the United Nations. Indeed, far from turning down the heat, a congressional focus on cutting funds to terrorist hangouts like UNRWA should be at the top of our agenda. Let the Israelis get all the champagne and (kosher) caviar they can at those parties they're now attending. But the rest of us should be intent on flushing out the sewer of corrupt anti-Semitism that flows through Kofi Annan's organization.